Leisa McCormick is responsible for advising students majoring in English and in digital technology and culture. Additionally, she assists humanities and linguistics students with registration questions. Leisa is normally available from 9:00 a.m. to 12:00 p.m. and from 1:00 to 5:00 p.m., Monday through Friday. By Appointment only. During pre-registration, appointments are required and can be made by emailing english@wsu.edu. Leisa can also be reached directly at lmccormick@wsu.edu. In January 2010, Leisa was hired as the advisor for the Department of English, where she advises students pursuing English and Digital Technology and Culture degrees. Leisa was born in La Crosse, Wisconsin, and migrated west with her family, settling in Bozeman, Montana. In 1987, Leisa and her family moved to Pullman in order to pursue educational opportunities for herself and her husband, Craig. Leisa graduated from the University of Idaho in 1993 with a B.A. in English literature and in 2002 with an M.A. in English (rhetoric and composition). 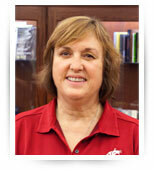 Before becoming the English department advisor, Leisa worked for the Pullman School District for 10 years. During her time with the Pullman School District, Leisa worked as the case manager for Eclipse, the alternative high school, and, meanwhile, she completed her secondary teaching certificate.